In the years 1838 to 1841 a severe drought was prevalent in New South Wales, causing touch loss of stock and anxiety to pastoralists, some of whom, in their desire to preserve their flocks and herds, sought for new pastures in parts of the Colony hitherto very sparsely occupied or wholly untraversed. The trend of the increasing pastoral occupation was especially marked towards the southward from the Monaro district, and to the south-east from the Yass Plains and Murrumbidgee River. This movement directly led to the opening up of settlement beyond the Murray River. In 1839, Angus McMillan, starting from McFarlane's Station of Currawang, Monaro, had reached Bukkanmungie, from which a hopeful prospect was observed to the south-west. In the next year, its the interests of his employer, Lachlan Macalister, a well-known grazier of Clifton, he had prosecuted further exploration southward through a fertile region of flue pastoral country as far as the La Trobe River, subsequently, to 1841, reaching the coast at Corner Inlet. McMillan's claims as the pioneer and precursor of the settlement which immediately followed by land and sea are indisputable; but the enterprise of Count Strzelecki,* in his bold expedition early its the year 1840, partly. along McMillan's route, is also noteworthy and memorable in the exploration of the province. It is with the latter achievement that this paper is concerned. In April, 1839, Count Paul Edmund de Strzelecki, a Polish scientist of repute, while on an extensive and prolonged tour of the world arrived its Sydney from New Zealand in the French barque Justine. Undertaking keen geological research in the Colony, he discovered gold near Hartley and Wellington in New South Wales. At the wish of the Governor, Sir George Gipps, who feared that the news of the discovery might have a disturbing effect upon the convicts who then formed so large a part of the population, publicity was not given at the time to the discovery. Later in the year the Count met Mr. James Macarthur, a grazier of Yass Plains, related to the Macarthurs of Camden, who, voyaging from Van Diemnen's Land in H.M.S. Pelorus, when driven close to the southern coast, had conceived the idea that good pasture-land must lie between the south coast and the dividing range. Impressed with the idea, he arranged for an expedition southward, and the Count, wishing to prosecute further geological research towards Wilson's Promontory, willingly agreed to accompany him. Macarthur, who had had previous experience in exploring the Yass plains, left Parramatta in January, 1840; and on February 3rd,** accompanied by a young man named James Riley and Charlie Tarra, an intelligent black, he set out from Gunnong for the Hume (Murray) River, from which it was intended to diverge in order to snake the as yet unattempted ascent of the highest Alpine summit in Australia. Strzelecki, with his valet, joined the party at Ellerslie. some miles further on. Some years ago Leslie Macarthur, F.G.S., mineralogist, the son of James Macarthur, having heard of the movement in Victoria to mark out the explorers' routes in Gippsland by a line of cairns, sent to one the following pages extracted from his father's field-book, describing the Count's ascent of the peak. In diary form, James Macarthur thus plainly relates the story which is evidently continued from the starting at Ellerslie a week earlier. Long text quote on the next page. If you do not want to read this _ skip _ this part of the text. March 9th, 1840.— I started from Messrs. Hay *** and Chalmers' Station on the Hume, accompanied by Count Strzelecki and two native guides, determined to reach the highest summit of the Australian Alps. Ascending the beautiful and highly picturesque valley of the Hume on the southern bank of the river passing Guise's **** station, we found our first check at a ford known by the natives under the name of „Nowang”. On the 10th we crossed the river to the northern bank, and following the valley upwards reached a small circular plain, „Gobollin”. It was more irregular than picturesque; the margin of the forest was as formal and unbroken. From this point, we ascended the higher ranges, and in about four miles reached a small but rapid creek. Here we determined to leave our horses under the charge of a friend, who had accompanied us so far, but did not feel the same ardour of discovery that incited the Count and myself to ascend the highest known peak in Australia. March 11th — Count Strzelecki, myself, and two natives started at 7 a.m. in high spirits to accomplish our object. The weather intensely hot, we marched on with our blankets and provisions au militaire. The Count carried in addition a heavy case of instruments for scientific observations. Ascending at once through a narrow gully, in about three miles we reached a gap overhanging the course of the river. Before us was the deep valley of a tributary flowing from the Dargan mountains at the head of the Tumut. We found the descent to the river so steep that we only accomplished it safely by clinging to the shrubs and small saplings. This locality is peculiarly the habitat of the Black Opossum, an animal common in Van Diemen's Land. On the opposite side of this fine stream we ascended an equally steep range; and descending again, found ourselves on the main stream of the Hume. We crossed to the right bank, and passing the junction of another branch or tributary, re-crossed to the left bank, reaching the spot at which our actual ascent of the mountains was to commence. The thermometer ranging upwards of 90 degrees during the day, we determined after refreshing ourselves to accomplish as much of the ascent as we could during the cooler hours of night, and only camp when the bright moonlight failed us. A fine lyre-bird furnished an ample supper and consoled us for the want of water. The early dawn of the 12th found us again on our way, and after five hours of tedious ascent we reached a small open spot. A fine spring afforded us the means of making a hearty breakfast. The only water wo had had during these many hours of toil was a single quart, afforded by our guide, Jacky, descending over some perpendicular rocks to a roaring torrent, which we could hear far below us but could not see. The spot we had now reached was the favourite camping-ground of the natives during their annual visit to feast on the Boogan^ Moth. Traces of their camps were visible in all directions. Our sable friends arrive thin and half-starved; and in a few weeks' revelling on this extraordinary food, clothe their skinny frames in aldermanic contrast. Dr. Bennett published in 1834 some very interesting details on this subjeet, observed by him on the adjacent ranges of the Boogan Mountains. It is from 2 to 3 feet high, bright green and succulent. It was very difficult to travel through flying mist, occasionally enveloped and accompanied by a keen, freezing air. After two hours of toilsome ascent, as we found ourselves still far from the topmost point, after consultation we determined to send back our guides for the blankets and provisions, and directed them to form a camp on the spot where we then stood. Strzelecki and I than proceeded towards the extreme summit width we reached after a very laborious climb. The air was bitterly cold. We found the actual summit divided into six or more points. The Count by the aid of his instruments quickly detected one of them as being in fact considerably higher than where we stood. A deep ravine, separating us from this, did not deter my adventurous friend; he determined to reach it. As the day was far advanced, I thought it more prudent to return toward the point where I had ordered the natives to await our return. Before leaving the Count he hold me of his intention of recording his visit to the highest point in Australia by associating the name of Kosciusko with our successful ascent. I could not but respect and feel sleep sympathy with my friend, when with his hat off, he named the patriot of his country. Parting on the summit, I commenced my descent, leisurely enjoying the ample supply of fine water-cress that abounded in every crevice of the rocks. The beautiful flowers, then in full bloom, afforded rue great pleasure. There were the flowers of early spring below, principally Euphorbiaceae. Immense masses of mica slate form groups here and there on the mountain's side. Towards evening I reached the spot where I had ordered our camp to be forested, but could see no trace of our sable friends. I shouted, fired my gun, but could get no answering signal. The approaching night made me feel deeply anxious respecting my own position, and that of my friend. My first care was to collect fuel and light a fire, to direct Strzelecki's descent by its light. The night was passing on; just as I was placing myself in the best position that I could find to feel the warmth of my small fire, I thought that I heard a faint shout or cooey. I climbed up a high rock overhanging a deep precipice oboist 100 feet below me. I saw the, reflection of the natives' fire. I scrambled back; and, making a rather perilous descent through a dark glen, reached the terrace, upon which my friends were comfortably established. I could hear nothing of Strzelecki, but immediately despatched Jacky to look for him, and very soon after had the satisfaction of shaking my friend by the hand. He had experienced many falls by the way but was unhurt. He produced from his bag the extreme summit of the height he had gained. I imagine lee leas still in his collection this interesting trophy. The Count had experienced more diffirally than he expected. Thee rather deep hollow that he crossed, after we parted, offered serious obstacles to his progress, from the endless confusion of rocks and the tall growth of the Munnong grass. He remarked the escape of carbonic acid gas from the fissures in the rocks. I had noted the regular hissing noise, but did not know its cause. The air after nightfall was alive with the Boogan moths causing a deepsounding humming noise in character like that of a gigantic bee-hive. On the most shaded side of the mountain there was still an extensive patch of snow, judged to be by my friend perpetual, as it was more or less stained by the decay of vegetation. This season was remarkable as being one in which the mountain was more free from snow than it had been before observed. On the 13th we made a rapid descent to the camp where we had left our horses. On the 14th the Count was engaged completing and verifying his observations. He found the height he had reached as 7,800 feet. This completes the notes taken from Macarthur's fieldbook. Since that first ascent several divergent estimates have been made of the height of Mount Kosciusko, evidently varying in accordance with the points from which the observations were taken. The figure now accepted, as determined by the more accurate observations of Dr. Griffith Taylor, is 7,340 feet. ^* Munyang. The name of the range leading up to Mt. Kosciusko. After again reaching Guy's Station on the Murray River, the party resumed the journey southward along Bowrang Creek; not by way of the Snowy River as erroneously stated in the Australian Encyclopedia, but as Strzelecki's map shows, close to the western side of the Gibbo Range and through the bed of Lake Omeo, probably as dry then as it is now. The stations of Ireland (Hyland) and Buckler (Buckley) are marked on the course, also Macalister's outstation, 50 miles from Omeo, on the Tambo, where in the absence of its founder, Angus McMillan, at Monaro, Matthew Macalister, his companion in charge, on 27th March extended hospitality, and went with the Count's party a day's journey along McMillan's track which they then followed as far as the Macalister River. Here, after crossing the stream, the party, taking a new course, came to the La Trobe River. Upon passing this, they soon entered very difficult country, where, abandoning their weary horses and impedimenta, they changed direction westward to make a forced march for Western Port. On scant rations, after 26 days „of incessant labour with the utmost exertion, stimulated by the sense of peril”, through dense forests and deep gullies, they reached Massie and Anderson's station at Western Port reached Massie and Anderson's station at Western Port on 12th May, 1840, in a state of exhaustion and semistarvation. Here they were hospitably entertained; and, in a few days after recruiting their energies, proceeded by easy stages through settled country to Melbourne. Some time stages through settled country to Melbourne. Some time later, James Riley, John Rutledge, Charlie Tarra and another black, Pigeon, from New South Wales, went back and recovered one horse and all the Count's specimens, etc. 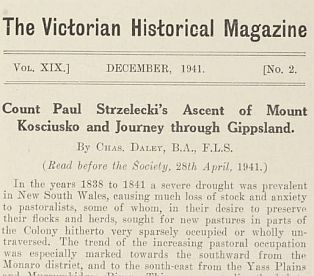 Of the region traversed Strzelecki wrote, „Scarcely any spot I know, either within or without the boundaries of New South Wales, on a large or a small scale, can boast such advantages as Gippsland”. Time has fully justified his favorable opinion. 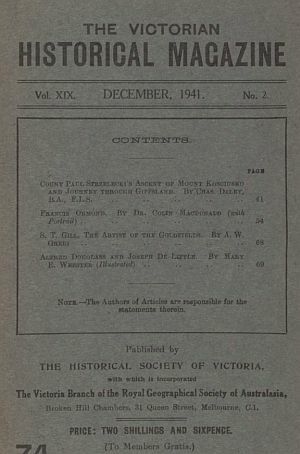 The Count's favorable report of the journey in the unknown country he had traversed, supplemented later by McMillan's delayed account of his own prior exploration, aroused general interest, and immediately set in motion the tide of settlement from New South Wales and Port Phillip, until in a very few years all available pastoral land was taken up by graziers in the new, fertile, and well-favoured province of Gippsland. On the publication of the report the Count was acclaimed as the pioneer of a new and fertile province. The Sydney Colonist of 9th July, 1840, drawing attention to Strzelecki's omission of any reference to McMillan's prior pioneering work, caustically remarks, „We think it a clear case that the credit of the discovery does not belong to the Courtt, and that he must have known it did not when he claimed the merit of it from the public”. It is to be regretted that this hasty stricture, based upon insufficient knowledge of the facts, and probably heightened by prejudice against a foreigner, should have been so readily accepted as true to the detriment of the Count's reputation, the imputation of unfairness to McMillan losing nothing by repetition in after years, and still lingering in some measure in Gippsland. It is not conceivable that Strzelecki, a cultured gentleman of irreproachable character, the valued friend of Sir George Gipps and Sir John Franklin, a keen scientist, and a public-spirited philanthropist, would do an injustice in any way to McMillan, whom he had not met, whose discoveries had not yet been made public, and of whose future movements and intentions he was quite unaware. The two expeditions, one from Monaro seeking pastures new for flocks and herds, the other from Yass Plains, scientific in its objects, were entirely different in character. They were undertaken at different times, their only contact being when Strzelecki's route converged at Macalister's outstation, Numblamungie, on McMillan's former track down the Tambo Valley and on to the Macalister River. 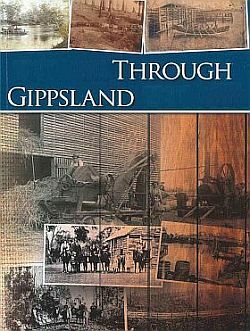 From this stream, which McMillan, owing to its flooded condition, could not cross, Strzelecki's own divergent course through Central Gippsland was in new, untrave,sed forest country to Western Port. McMillan did not resume further exploration towards Corner Inlet until after Strzelecki had gone to Van Diemen's Land, nor did he reach Port Albert until 14th February, 1841, nine months after Strzelecki's party had emerged from the wilds at Western Port. There is no evidence that the taco pioneers of discovery ever met. McMillan immediately after reaching Port Albert became a permanent resident of Gippsland. Strzelecki, except for a visit to Sealers' Cove, Wilson's Promontory, never returned to the district. From Port Phillip he went to Van Diemen's Land by the brig Emma in July, 1840, arriving at Launceston on July 30. It was natural and reasonable that Strzelecki, in ignorance of any previous and unpublished nomenclature by Angus McMillan, should mane the physical features—rivers and lakes—met with. Later on, with full knowledge of the part McMillan had taken in prior exploration, McMillan's names were officially retained, except those of Gippsland, named by Strzelecki after the Governor, Sir George Gipps, Lake King, named after his friend Captain P. P. King, the first native-born Admiral, and the Perry river after the Surveyor-General of New South Wales. The La Trobe river was named in 1841 after Superintendent Charles Joseph La Trobe by W. A. Brodribb's party, who reached it from Port Albert, and also named Lake Wellington. Time has in a great measure remedied early misunder-standings. 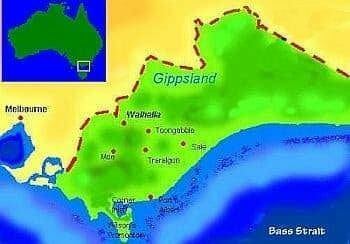 The separate, but emplementary labours of each of the two explorers through Southern and Western Gippsland respectively have been fully recognized, and the merits of each fully acknowledged. Of Strzelecki's companions James Macarthur, on return to Sydney, had no further connexion with the province of Gippsland. James Riley afterwards took up pastoral occupation in Western Victoria. Some of his descendants are still residing in this State.